In the premiere episode of TLC's "Sarah Palin's Alaska," the former vice presidential nominee and her family embark upon a series of wholesome, firmly non-political activities: There's bear-watching, mountaineering and even some mother-daughter cupcake-baking. Palin's political stature gets only vague recognition over the course of the episode, and President Obama is never referenced. Still, the tacit political implications of "Sarah Palin's Alaska" are hard to avoid. The show, an eight-part series that TLC describes as a "family adventure story," is purported to show viewers the wonders of America's "final frontier." But some see "Sarah Palin's Alaska" as an eight-part campaign ad for a potential future presidential candidate. Indeed, Palin, who some reports say is earning as much as $1 million per episode (though that seems unlikely and she told USA Today it's less than that overall), is one of its executive producers - which inevitably means she has a certain degree of control over how she is portrayed in it. "Ultimately the network has creative control and approval over the show, but really across the production company and the Palin family it was quite a collaborative effort, which is consistent with the way we produce most of our shows," TLC President Eileen O'Neill said in an interview with the Los Angeles Times. 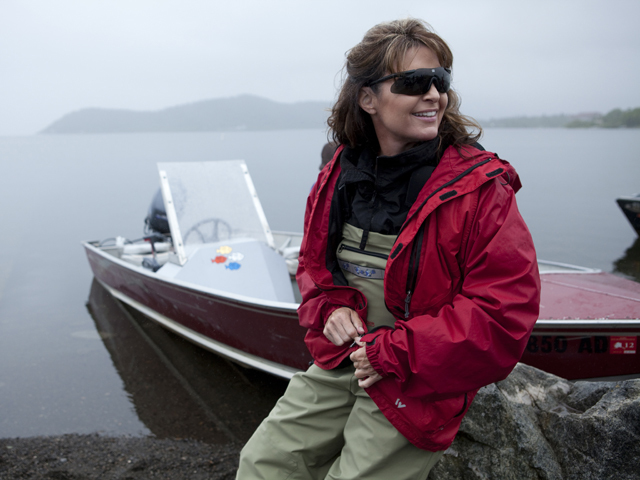 In the show, Palin presents herself as part adventurous frontierswoman, part hard-working mom. When she's not fishing for salmon or facing off with brown bears (which she grudgingly admits aren't the same as "mama grizzlies"), Palin is chiding her teenage daughter, Willow, for trying to sneak a boy upstairs. Track pants feature prominently in the former governor's on-air wardrobe, and the word "Amen" is slipped casually into conversation. But while the show appears geared more toward remaking Palin's image than in showcasing her policy positions, the first episode is not entirely lacking in her characteristic political commentary: At one point, while criticizing journalist Joe McGinniss for moving into the house next door while conducting research for a book about her, the former governor points to the 14-foot wall her husband, Todd, built to keep him out. "By the way, I thought that was a good example, what we just did, others could look at and say, 'Oh, this is what we need to do to secure our nation's border,'" Palin says. "Oh, God help me. I'm scared...That's scarier than I thought. Holy jeez....I'm so scared I can't even move. Oh, God. Help me Lord," Palin cries. "I just don't like heights. I was so cocky. I'm being punished for it. I don't know if I can do this." It has been reported that Palin did object to certain moments included in the show -- when Willow tries to sneak up her male friend, for instance, or when Piper complains about her extensive BlackBerry use -- which indicates that the former governor may not have quite as much control over how she is portrayed on the program as she would like. And though she swears that "Sarah Palin's Alaska" is not a "reality" show, its success in remaking her image to the desired effect may hinge on just how "real" it turns out to be. Lucy Madison is a political reporter for CBSNews.com. You can read more of her posts here. Follow Hotsheet on Facebook and Twitter.